Measurement of SV exocytosis in dopaminergic neurons. A, Representative fluorescence images of a cultured VTA neuron transfected with vMAT2-pHluorin at rest (left), after stimulation with a train of 100 APs delivered at 10 Hz (middle), and after perfusion with 50 mM NH4Cl in Tyrode’s solution (with an equivalent reduction in NaCl) to alkalinize the SV interior (right). Scale bar, 10 μm. B, Representative traces of fluorescence responses to 100 APs at 10 Hz after 5 s of baseline fluorescence values (top), and to perfusion with 50 mM NH4Cl (bottom). Vertical arrow represents the change in fluorescence (ΔF). Blue bars indicate electrical stimulation (top) or NH4Cl perfusion that defines the TP (bottom). C, Fluorescence images of a neuron transfected with vMAT2-pHluorin (green, left) and stained post hoc with anti-TH (red, middle). 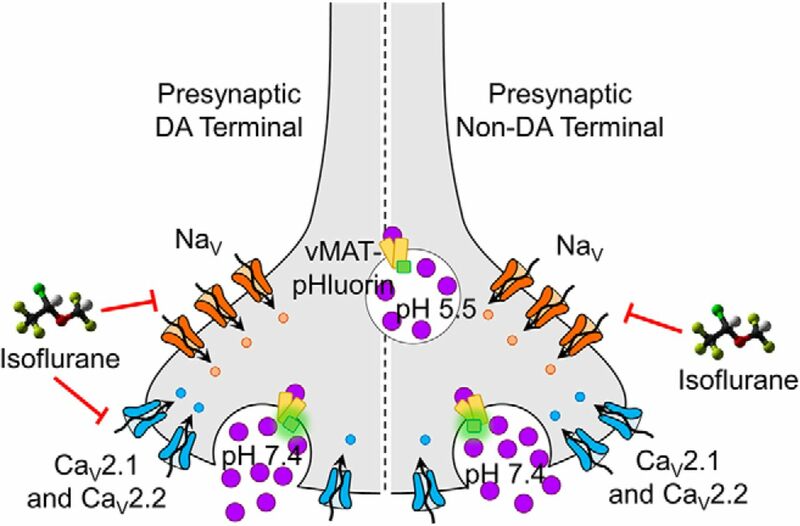 Composite image shows overlap of vMAT2-pHluorin and TH indicating this neuron is dopaminergic (right). Scale bar, 10 μm. 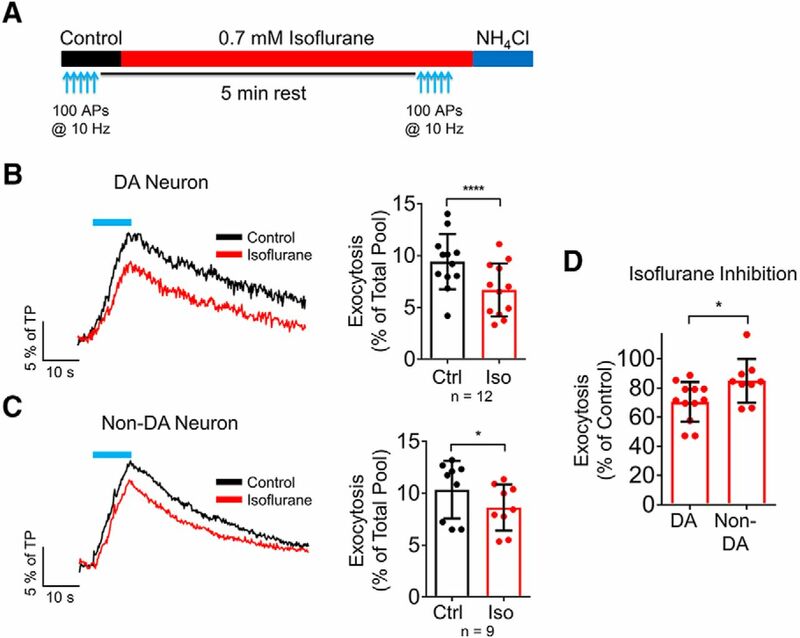 Isoflurane differentially inhibits SV exocytosis in dopaminergic and non-dopaminergic neurons. A, Schematic of protocol used to assess the effect of isoflurane on SV exocytosis. 100 APs were delivered at 10 Hz (blue arrows) under control conditions, followed by perfusion with 0.7 mM (2 MAC) isoflurane for 5 min (red bar), and a second stimulation of 100 APs at 10 Hz in the presence of isoflurane. Lastly, NH4Cl was perfused to determine the TP (blue bar). B, C, Mean values of vMAT2-pHluorin response amplitudes in control and isoflurane-treated neurons stimulated with 100 APs at 10 Hz; ****p < 0.0001; *p < 0.05 by two-tailed paired t test. Representative raw traces from a dopaminergic (DA) and a non-dopaminergic (non-DA) neuron are shown. D, The effect 0.7 mM isoflurane on 100 AP-evoked exocytosis was greater in dopaminergic than in non-dopaminergic neurons; *p < 0.05 by one-tailed t test. Elevated KCl depolarization-evoked SV exocytosis is NaV independent. A, Schematic of the protocol used to determine the effect of TTX on exocytosis evoked by elevated KCl or electrical stimulation. B, Representative traces of vMAT2-pHluorin response to elevated KCl depolarization or electrical stimulation in the absence or presence of 250 nM TTX (left). Mean values of vMAT2-pHluorin response amplitudes (right). ns, not significant by paired one-way ANOVA with Tukey’s post hoc test. Isoflurane differentially inhibits SV exocytosis in dopaminergic neurons via a Nav-independent mechanism. A, Schematic of protocol using a pulse of 50 mM KCl (with an equivalent reduction in NaCl, green bars) to induce exocytosis in the absence or presence of isoflurane. B, C, Mean values of vMAT2-pHluorin response amplitudes in control and 0.7 mM isoflurane-treated neurons stimulated with elevated KCl. Traces show representative raw traces from a dopaminergic (DA) and non-dopaminergic (non-DA) neuron; ***p < 0.001; ns, not significant by two-tailed paired t test. D, Comparison of the effect of isoflurane on KCl-evoked exocytosis; ***p < 0.001 by one-tailed t test. CaV2.1 and CaV2.2 contribute to SV exocytosis in VTA neurons. A, Schematic of protocol using trains of 100 APs in the absence (black) or presence of ω-conotoxin GVIA (cono, 1 μM, purple bar) alone, ω-agatoxin IVA (aga, 400 nM, orange bar) alone, or both toxins together. B, Comparison of the effect of conotoxin and agatoxin on dopaminergic and non-dopaminergic neurons. 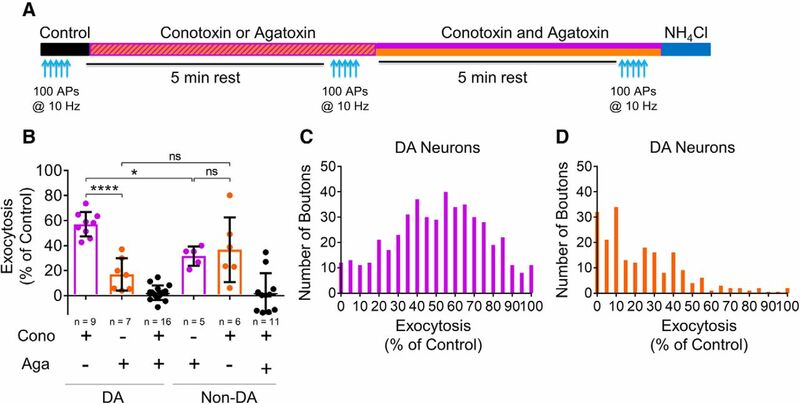 The combination of conotoxin and agatoxin abolished exocytosis in both dopaminergic (DA) and non-dopaminergic (non-DA) neurons; ****p < 0.0001; *p < 0.05; ns, not significant by unpaired one-way ANOVA, Tukey’s post hoc test. C, Histogram displaying the bouton-by-bouton effect of conotoxin alone on exocytosis in dopaminergic neurons for all boutons (n = 9 neurons). Data have been constrained from 0% to 100% of control exocytosis. D, Histogram displaying the bouton-by-bouton effect of agatoxin alone on exocytosis in dopaminergic neurons for all of boutons (n = 7 neurons). Data have been constrained from 0% to 100% of control exocytosis. Isoflurane inhibits elevated KCl-evoked SV exocytosis mediated by CaV2.1 or CaV2.2 in dopaminergic neurons. A, Schematic of protocol using depolarizing pulses of 50 mM KCl with 1 μM conotoxin and 0.7 mM isoflurane or with 400 nM agatoxin and 0.7 mM isoflurane in dopaminergic neurons. B, Mean values of vMAT2-pHluorin response amplitudes in conotoxin and conotoxin + isoflurane treated dopaminergic neurons stimulated with elevated KCl; ***p < 0.001 by two-tailed paired t test. C, Mean values of vMAT2-pHluorin response amplitudes in agatoxin and agatoxin + isoflurane treated dopaminergic neurons stimulated with elevated KCl; *p < 0.05 by two-tailed paired t test. D, Comparison of the effect of isoflurane on CaV2.1 and CaV2.2 mediated elevated KCl-evoked exocytosis. ns, not significant by one-tailed t test. 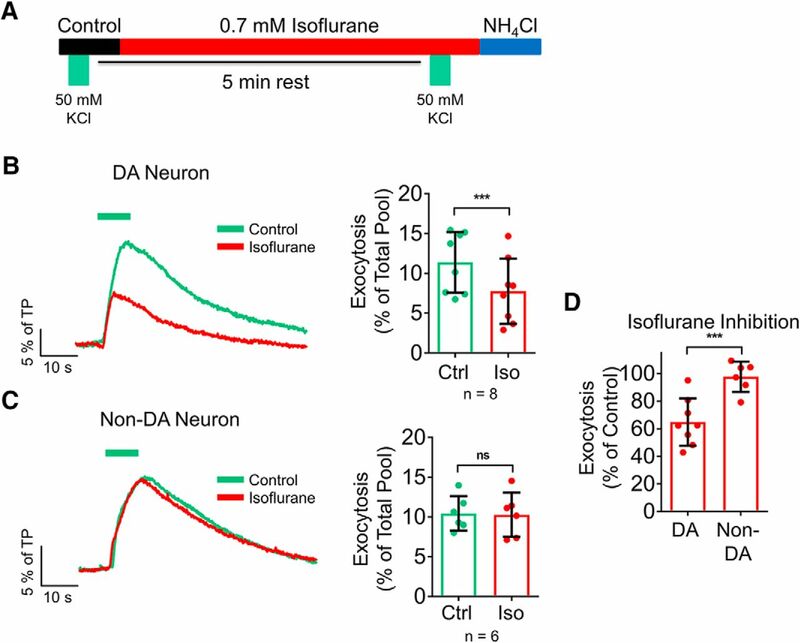 Isoflurane inhibits SV exocytosis in dopaminergic neurons by reducing Ca2+ influx. A, Schematic of single AP (1 AP) evoked exocytosis protocol with 2 mM [Ca2+]e (black bar), 4 mM [Ca2+]e (gray bar), and 2 MAC isoflurane in 4 mM [Ca2+]e (red bar). B, Ensemble average traces and mean values of 1 AP-stimulated exocytosis reported by vMAT2-pHluorin; **p < 0.01; ns, not significant by paired one-way ANOVA, Tukey’s post hoc test. C, Schematic of the Ca2+ influx protocol with Fluo-5F (yellow bar) followed by washout and 1 AP stimulation with 4 mM [Ca2+]e (gray bar), 0.7 mM isoflurane in 4 mM [Ca2+]e (red bar) or 2 mM [Ca2+]e (black bar). D, Fluorescence microscopy image of VAMP-mCherry transfected neuron from which Ca2+ signals were recorded. Scale bar, 5 μm. E, Fluorescence traces from individual boutons of the neuron in panel D with and without isoflurane in 4 mM [Ca2+]e. Mean responses are shown in bold. F, Ensemble average traces. G, Mean values of 1 AP-stimulated Ca2+ influx reported by Fluo-5F in 4 mM [Ca2+]e, isoflurane in 4 mM [Ca2+]e, 2 mM [Ca2+]e, or isoflurane in 2 mM [Ca2+]e(right); ***p < 0.001; ns, not significant by paired one-way ANOVA with Tukey’s post hoc test. Presynaptic mechanisms of isoflurane. In non-dopaminergic (non-DA) neurons, isoflurane inhibits SV exocytosis by inhibiting Na+ channels to reduce nerve terminal excitability. 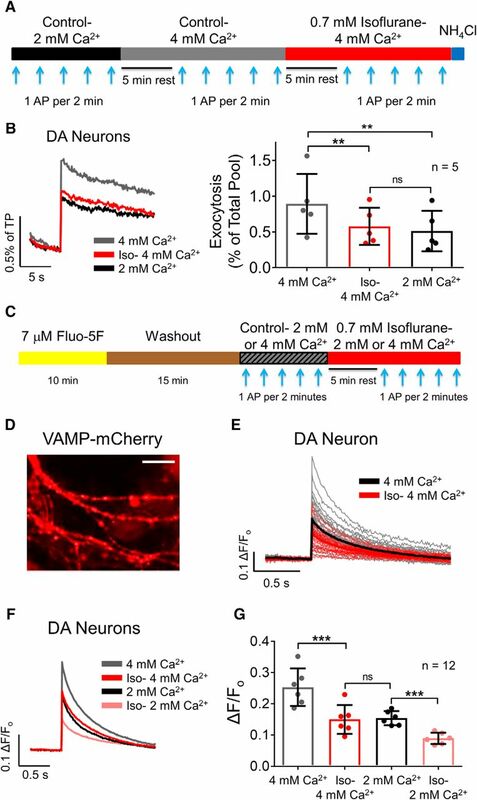 In dopaminergic (DA) neurons, isoflurane can also reduce SV exocytosis by a Na+ channel-independent mechanism mediated by inhibition of CaV2.1 and CaV2.2. The fluorescence of vMAT2-pHluorin is quenched by the acidic (∼pH 5.5) SV interior. On exocytosis and fusion with the plasma membrane, vMAT2-pHluorin fluoresces on exposure to the pH neutral (∼pH 7.4) synaptic cleft.